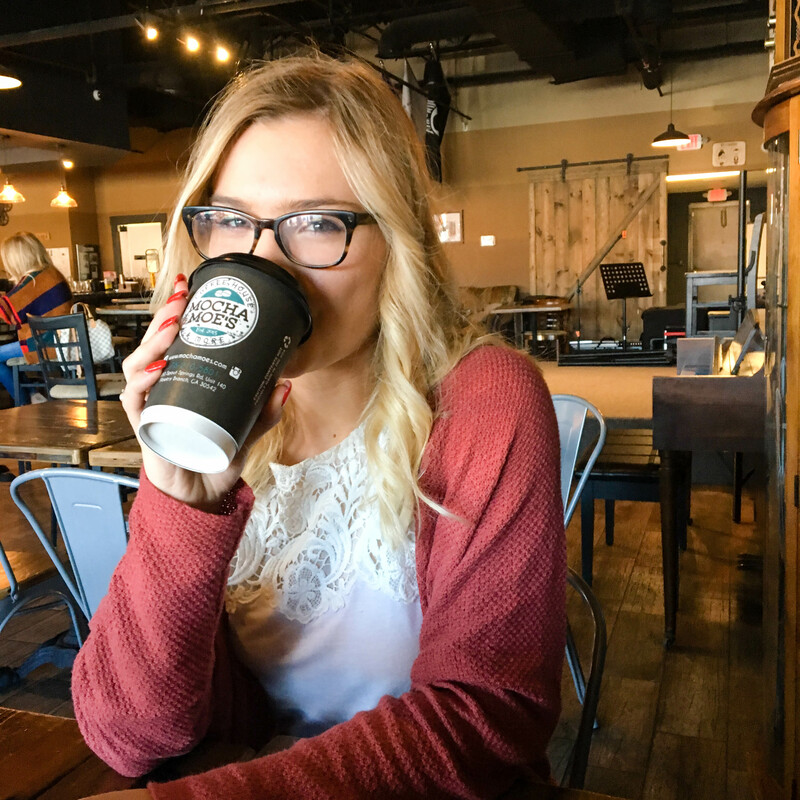 The fact that I got behind on writing all of my travel posts is actually kind of nice, because it’s allowing me to relive some of my favorite adventures even though I’m back on my least favorite side of the pond. One place that I really wanted to visit while I was in Europe was Amsterdam, so I made a point of making sure that this trip happened. I’m so glad I did, because it’s such a beautiful city. 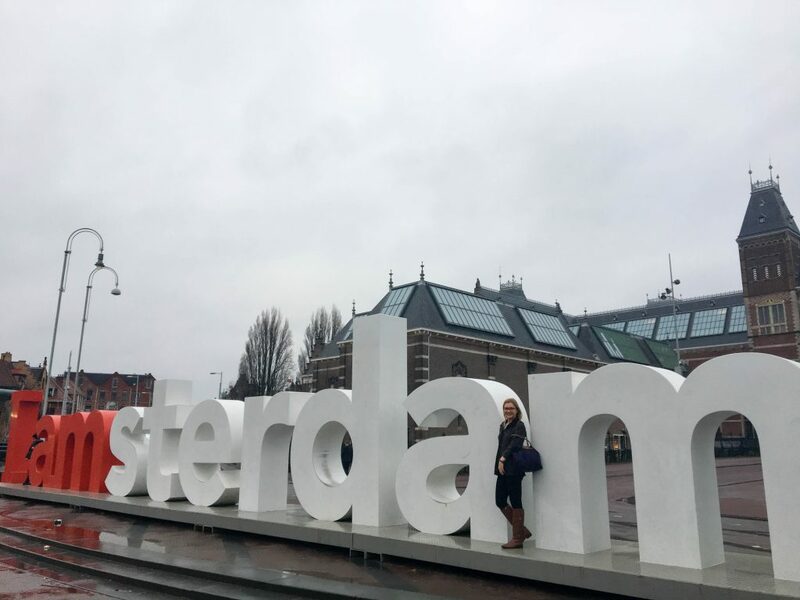 Without further ado, here’s how I spent 48 hours in Amsterdam! 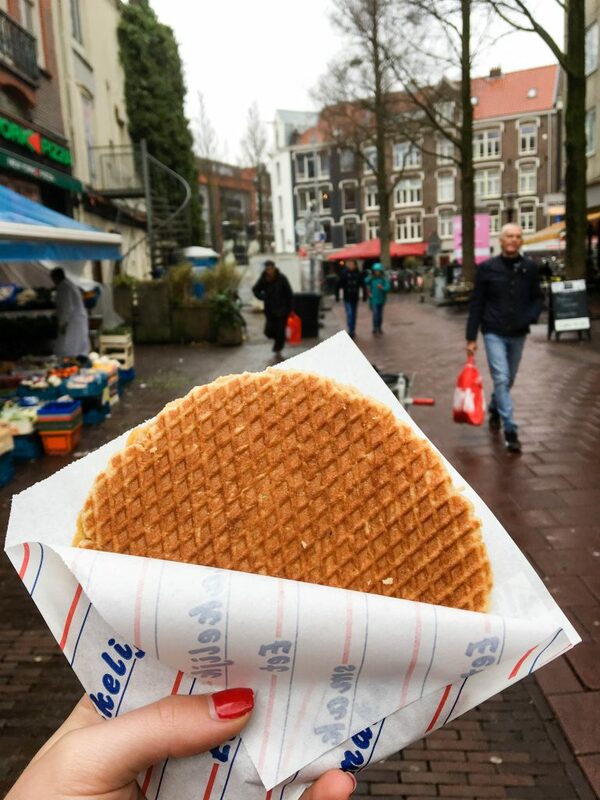 My bus got to Amsterdam around 11 am, so I immediately made a beeline for this outdoor market filled with street food in order to check off the first item of my Amsterdam to-do list: eat a stroopwafel. If you’ve never heard of these, they’re basically a thin, slightly crispy waffle filled with caramel. SO GOOD, especially if you get one that’s hot and fresh. Heads up, you need to order tickets for this museum in advance, and your reservation is for a specific timeslot. There were people who didn’t know this and got to the museum only to be told it was completely booked for the day. Make your reservation online and it’ll save so much time and trouble. Same for the Rijksmuseum, although that one doesn’t have a timeslot requirement. 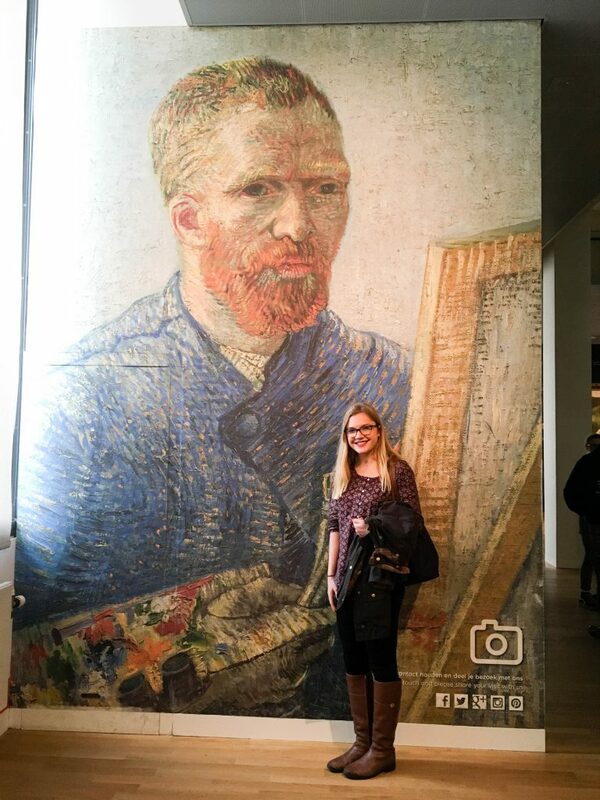 The Van Gogh Museum is beautiful and arranged so that you get a really clear picture of Van Gogh’s progression as an artist. I’m not a huge museum person but I loved this one. 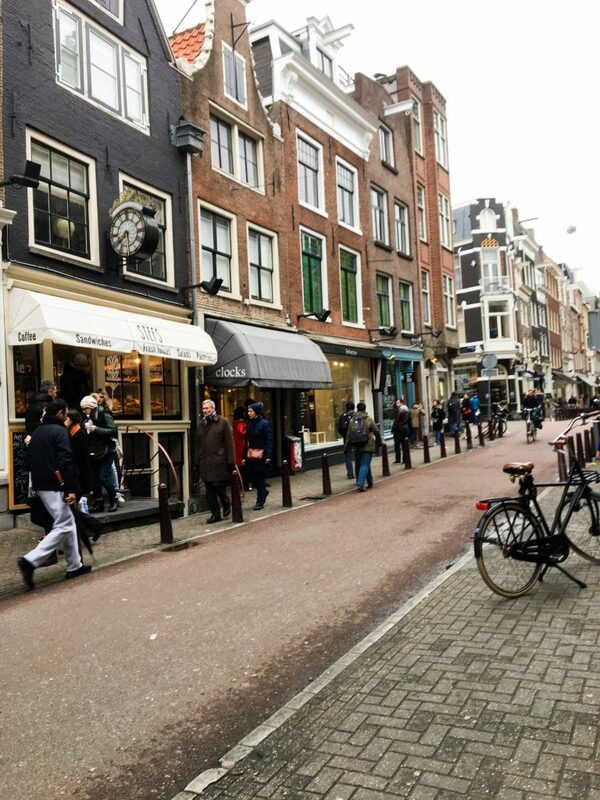 Amsterdam has a bit of a reputation as far as certain drugs go, and people there sure know how to profit off of that reputation. As such, there’s an endless supply of crazy places offering the most absurdly unhealthy but completely delicious foods. 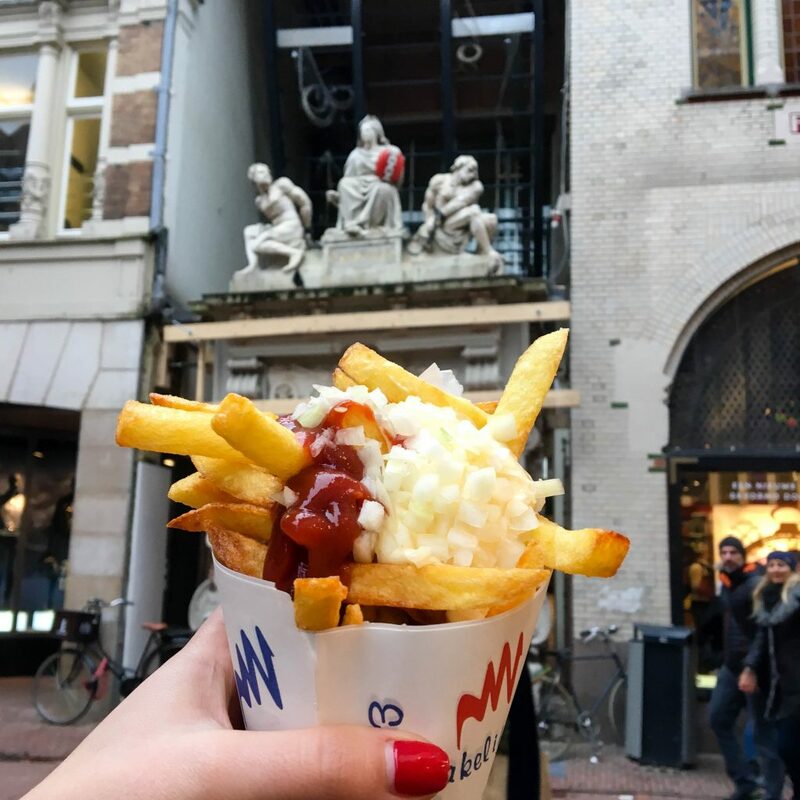 One of the better-known places is Vlaams Friteshuis Vleminckx (that’s a mouthful amirite) which sells Belgian fries topped with heaping spoonfuls of sauce. I got an order topped with Belgian mayo, ketchup, and onions – one of their specials. This was basically my dinner, it was so filling and amazing. Fries are eternally one of my greatest weaknesses, so you better believe when I found out there was a notorious fries vendor I was all over that. Other than fries, you can find some of the most sugary concoctions ever, and almost everything can be topped with a heaping spoonful of Nutella. This place would be super-dangerous for my fitness levels if I stayed here long-term, I’m telling you. For once, a Dutch word that I was actually able to immediately understand. (Luckily for me, pretty much everyone in Amsterdam speaks English. I always feel bad for not being able to speak a word of the local language but English was so common here that I didn’t feel as guilty about it as normal.) 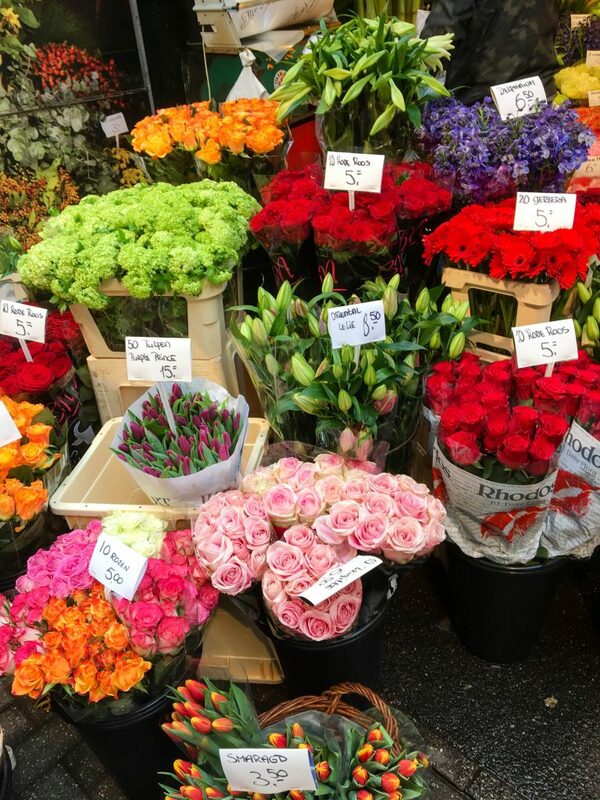 Anyways, this is a huge outdoor flower market with Dutch tulips galore. I was a bit too nervous about all the traveling I still had to come to buy any tulips (taking them through UK customs, back through EU customs, and finally through US customs was a bit too much stress for me), but I had so much fun strolling down the street and looking at the pretty blooms. This is the ultimate tourist photo op, so naturally I had to take advantage of that. As usual, my determination for that perfect Instagram picture drives way too much of my behavior, so I woke up super early so that I could beat the crowds and get a picture with the sign that didn’t have anyone else in it. Luckily, my efforts were successful and resulted in a pretty solid shot with the sign. 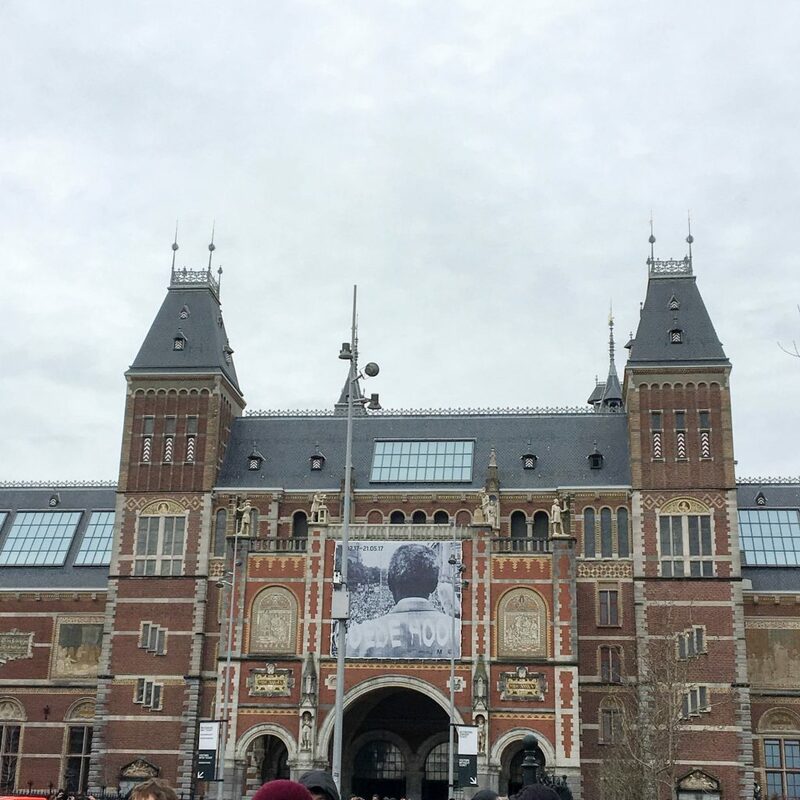 I don’t know why I thought a huge museum building somehow didn’t correlate to a huge museum collection, but the volume of art and history in the Rijksmuseum was staggering. I didn’t quite give myself enough time to appreciate everything that the museum had to offer, but I was still stunned by the variety of pieces displayed. However, a word to the wise on this one: don’t do a bike tour if you’re not comfortable riding a bike in a city environment. Luckily, I’d ridden a bike for much of my time in Oxford so I didn’t have too much trouble (with the exception of the fact that I wasn’t quite accustomed to riding on the right side of the road, haha). This is the only restaurant I’m recognizing by name, solely because this place had the single best veggie sandwich I’ve had in my life. That is all. I used overnight buses to get to and from Amsterdam, so I ended up leaving relatively early on the second day (hence the abbreviated schedule). If I’d had more time, I would’ve loved to take a canal tour – there’s something different in the perspective you get of a city in its waterways than in its streets. 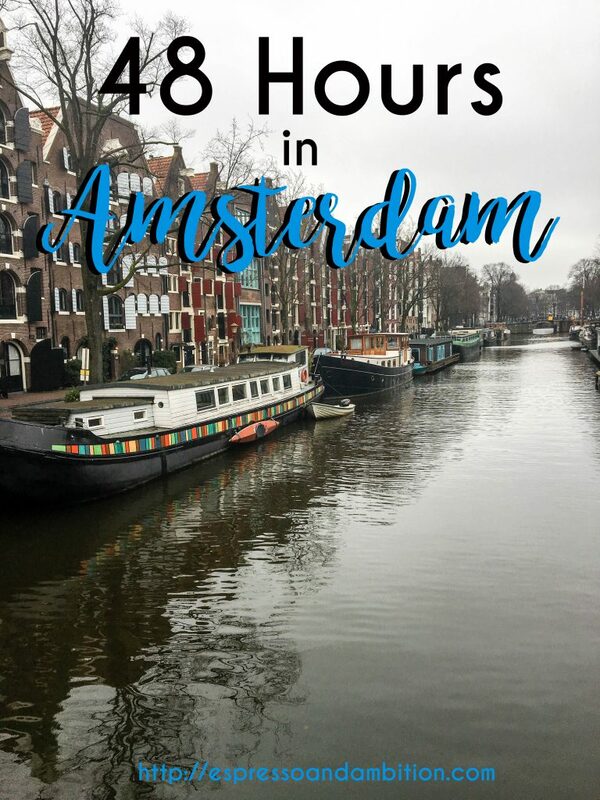 Anyways, that’s the gist of my trip to Amsterdam – if you’re looking at taking a short trip there any time soon, I hope this helps you plan your time wisely! 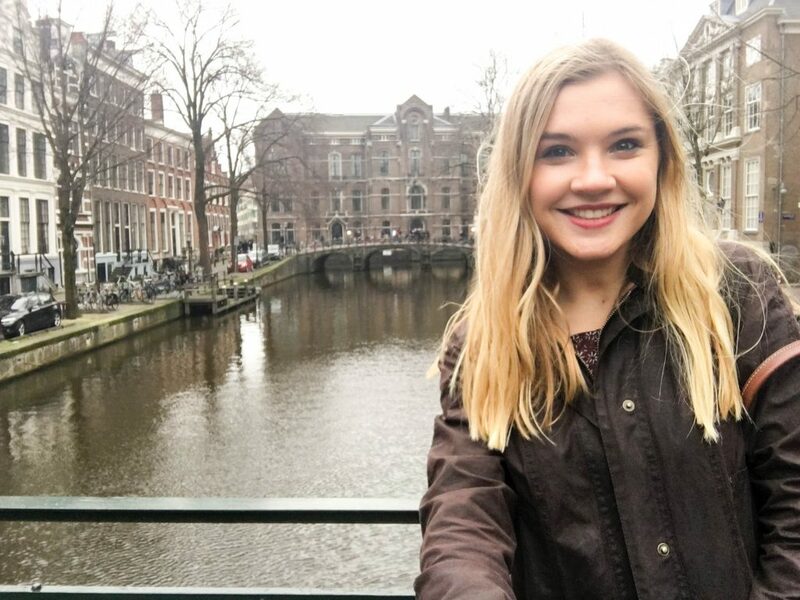 Amsterdam canals are prime selfie-stick territory, obviously. The food there looks so yummy!! I’d love to travel there someday! Amsterdam is absolutely gorgeous and in my top 5 dream destinations for sure. I’m already so in love with it, I know I’d love it even more if I got to visit. Flights to Europe from Australia are quite expensive though, but I’m sure I’ll get there one day!